Good evening World; here is a Progress Report. I am heaps better; daily there are improvements. 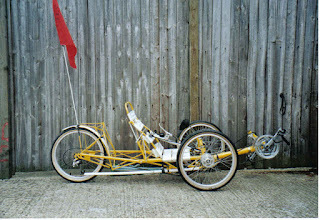 The penny trike only managed to get used going round the garden: I still haven't thought up a seat for it. which was rather higher geared than I'd imagined till I came to that hill going up to the Mot Bridge. My standard 18.55 mile daily ride took two and a half hours, and on one occasion the front tyre blew out and I had to push it two miles home having omitted to bring a repair kit, thereby discovering that a trike makes quite a decent walking frame. An interesting observation was that, when pedalling a tricycle with a crutch bungeed to the crossbar, you no longer exist. Overtaking cyclists pass you without a word. Oncoming cyclists ignore your cheery wave. It's not as if I even take sugar. "Where have you come from on that?" "Oh. That's a very long way. You shouldn't be going so far. You need to be careful - at least you're not weight-bearing. I've nursed a lot of patients with a broken hip." I thanked her politely, wondering if she always offered random people in carparks free nursing advice, and what she'd do if you were to ask, say, for a gratuitous haemorrhoid massage while she was about it. Then a skinny boy of about twenty saw the trike and said "Awesome, bro!" so that cheered me up. 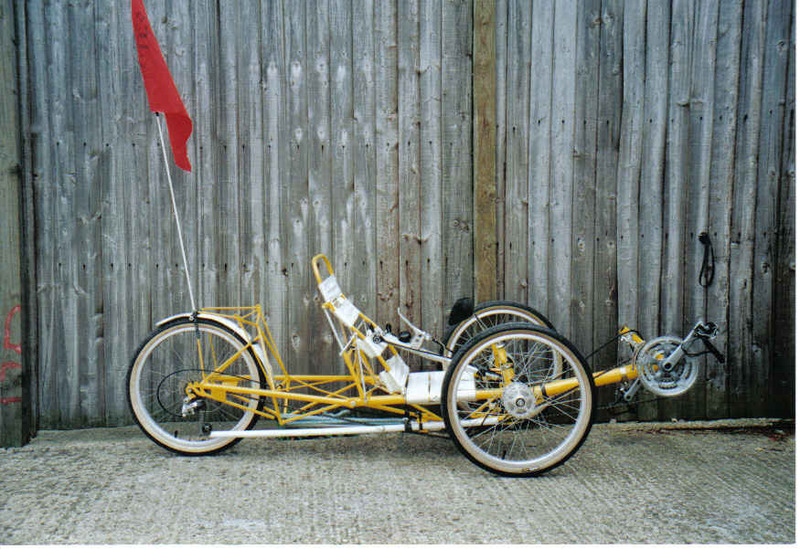 The yellow trike. It's a bit grubbier now. That photo must be from at least fifteen years ago. My daily ride is now an hour and three quarters - not quite the hour it normally takes but who cares - what else would I be doing? Well yesterday it was mowing a lawn and today I mowed another, and though I was a bit lurchy and it took three times as long, I felt very proud. And just for fun I put the original 170mm cranks back on the white trike and found I can now ride it, no bother. All we have to do is wait till I can balance and get onto two wheels. Just as a matter of interest, I asked the consultant at Outpatients how much the steel implant cost, and found it was $1,800 and that each screw was another $100. But then thirty years ago, a broken neck-of-femur meant lying in a hospital bed for six months under traction at $700 a night. All in all, a bargain. It has been reported elsewhere that Mr Burrows intends to be back racing in July, which certainly puts this six months nonse firmly to bed ha ha. I have seen cases of motorcycle racers being back on the track 6-7 weeks after breaking legs, though it was likely the other end of the limb in those cases. And as promised, Bomber Burrows raced yesterday. Yay and, moreover, hurrah! Is it not time for a sit-rep from you, Sir?